They say that smell is the sense most closely linked to memory...I would say that taste is a close second. Every time I make traditional Texas fajitas, I'm transported to San Antonio, Texas. I was 9 years old and one of my dad's co-workers invited our family over for a barbecue. They made fajitas with marinated flank steak (or skirt steak), grilled on the barbecue. They were like heaven on my tongue. I may have been born in Texas (Lubbock, where my dad was in pilot training for the Air Force.) But I became a true Texan with that first bite of fajita. Of course a true Texas Fajita must be served with the best salsa and guacamole. Those recipes will be posted tomorrow. 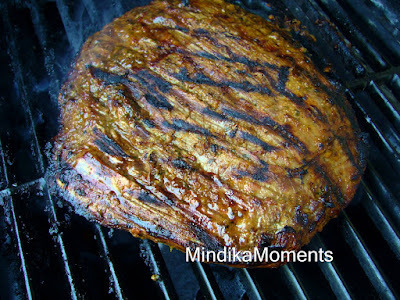 Below is the recipe I've come up with over the years for a delicious steak marinade. 1. Combine all ingredients in a blender, or use a hand/stick blender to incorporate into a thick, yet runny marinate. 2. Place the flank or skirt steak into a zip lock bag, along with the marinade. 3. Allow to marinade for overnight in the refrigerator. 4. Remove from the refrigerator and allow to sit on the counter 1 hour before you plan to barbecue. 5. Remove the meat from the bag, wiping excess marinate off. 6. Heat the grill and spray with oil or non-stick cooking spray. 8. Remove from the grill and allow meat to sit for 10 minutes prior to cutting. 9. slice against the grain, into long stripes for the fajitas.